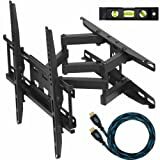 FREE 6ft 1080p Male-Male HDMI Cable Included! 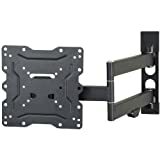 This mount fits most 23-55″ TVs sold today. 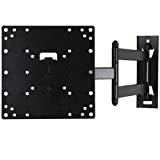 Specifically, it fits TVs with mounting holes as close as 2″x2″ or as wide as 16″x16″ (in TV terms – VESA 50×50mm to 400×400mm) and up to 66lbs. 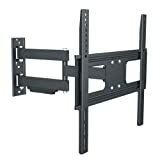 Steel construction, supports TV up to 135 lbs, Mount to wood wall studs up to 16″ on center. 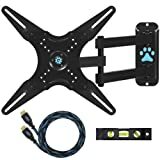 15° degree Tilt, 180° Swivel and 3° left & right screen adjustment. Max weight capacity: 88lbs. 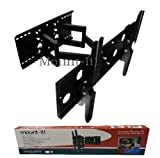 This is our premium, Best Selling Swivel Mount. 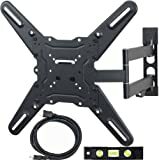 It offers extreme versatility, with a maximum extension of 20 inches. 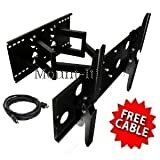 Black, Full Motion Tilts&Swivels Plasma LCD LED HDTV Wall Mount Bracket for 32 37 40 42 46 47 50 52 flat panel displays–Free Hdmi Cable!